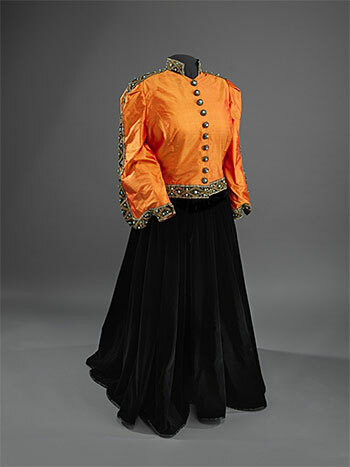 The orange-and-black velvet ensemble Marian Anderson (1897-1993) wore during her Easter Sunday performance on the steps of the Lincoln Memorial in 1939. Photo by Hugh Talman / Smithsonian Institution. This exhibition tells the story of African American music from the arrival of the first Africans to today’s hip-hop. Here, history and culture intermingle and music serves as the crossroads between musical traditions and stories of cultural and social development. The gallery is organized by musical genres and themes rather than chronologically, covering classical, sacred, rock ’n’ roll, hip-hop, and more. piano and bench used by Thomas Dorsey (known as the father of gospel) at the Pilgrim Baptist Church in Chicago, where he served as music director for 40 years. Mahalia Jackson, Aretha Franklin, and The Staples Singers are among those who sang at the church. objects related to Public Enemy, the group that voiced the tenets of black pride and racial awareness.